This volume investigates our ability to capture, and then apply, expertise. In recent years, expertise has come to be regarded as an increasingly valuable and surprisingly elusive resource. Experts, who were the sole active dispensers of certain kinds of knowledge in the days before AI, have themselves become the objects of empirical inquiry, in which their knowledge is elicited and studied -- by knowledge engineers, experimental psychologists, applied psychologists, or other experts -- involved in the development of expert systems. This book achieves a marriage between experimentalists, applied scientists, and theoreticians who deal with expertise. It envisions the benefits to society of an advanced technology for capturing and disseminating the knowledge and skills of the best corporate managers, the most seasoned pilots, and the most renowned medical diagnosticians. This book should be of interest to psychologists as well as to knowledge engineers who are "out in the trenches" developing expert systems, and anyone pondering the nature of expertise and the question of how it can be elicited and studied scientifically. The book's scope and the pivotal concepts that it elucidates and appraises, as well as the extensive categorized bibliographies it includes, make this volume a landmark in the field of expert systems and AI as well as the field of applied experimental psychology. Contents: Preface. Part I: Introduction. R.R. Hoffman, Doing Psychology in an AI Context: A Personal Perspective and Introduction to This Volume. S.B. Regoczei, G. Hirst, Knowledge and Knowledge Acquisition in the Computational Context. Part II: Cognitive Theory and Expertise. N.J. Cooke, Modeling Human Expertise in Expert Systems. R.M. Schumacher, M.P. Czerwinski, Mental Models and the Acquisition of Expert Knowledge. J.F. Sowa, Conceptual Analysis as a Basis for Knowledge Acquisition. Part III: Knowledge Elicitation Methods. S.E. Gordon, Implications of Cognitive Theory for Knowledge Acquisition. K.M. Ford, J.R. Adams-Webber, Knowledge Acquisition and Constructivist Epistemology. D.S. Prerau, M.R. Adler, A.S. Gunderson, Eliciting and Using Experiential Knowledge and General Expertise. K.L. McGraw, Managing and Documenting the Knowledge Acquisition Process. G.A. Klein, Using Knowledge Engineering to Preserve Corporate Memory. Part IV: Psychological Research on Expertise. R.J. Sternberg, P.A. Frensch, On Being an Expert: A Cost-Benefit Analysis. F.S. Bellezza, Mnemonics and Expert Knowledge: Mental Cuing. S.J. 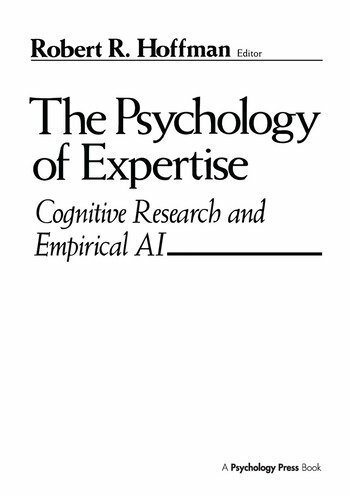 Ceci, A. Ruiz, The Role of General Ability in Cognitive Complexity: A Case Study of Expertise. Part V: Expert-Novice Differences and the Development of Expertise. M. Foley, A. Hart, Expert-Novice Differences and Knowledge Elicitation. R. Mack, J. Burdett Robinson, When Novices Elicit Knowledge: Question Asking in Designing, Evaluating, and Learning to Use Software. R.L. Campbell, N.R. Brown, L.A. DiBello, The Programmer's Burden: Developing Expertise in Programming. Part VI: Overview. S. Regoczei, The Psychology of Expertise and Knowledge Acquisition: Comments on the Chapters in This Volume. Appendices: Bibliography: Psychological Theory and Reviews. Bibliography: Empirical and Experimental Investigations of Expertise. Bibliography: Knowledge Elicitation. Bibliography: Automated Knowledge Elicitation, Representation, and Instantiation ("Knowledge Acquisition"). Bibliography: Expertise in Programming. Bibliography: AI Theory, Philosophy, and Reviews of Expert Systems. Bibliography: Applications of Expert Systems. Bibliography: Programming, Building, and Verifying Expert Systems.